Italy, meet Seattle. The best of both worlds. 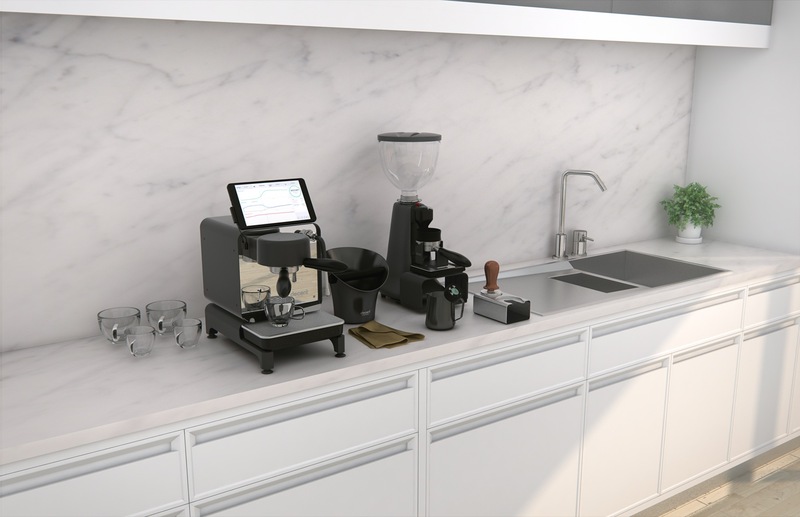 Our goal is the espresso quality you get from Italian professional espresso machines such as the La Marzocco™ Strada EP, but in a machine made for your home. By applying the engineering chops of Seattle's high tech community, we aim to extend the vision of what an espresso machine can be. We achieve rock-solid temperature and pressure with technology, instead of a large metal boiler. A touch tablet controls everything. The Internet is part of our DNA. Our heroes are Synesso™ and Slayer®, two other Seattle-based companies innovating amazingly in the professional barista market. We hope to do the same for the highly discerning home espresso drinker. Espresso is very exacting: your brew temperature and pressure have to be nearly perfect. Off by a few degrees and your drink will be acceptable, but not great. We solve this with our own water-mixing technology, which combines slightly-too-hot water with a small stream of cool water to get it just right. Not only does it nail the desired pressure, but it's one of the few espresso machines to tell you the real pressure at the coffee puck. Most espresso machines tell you the pressure at the pump, which is not useful. This need for precision is why most coffee shops make so-so espresso drinks. Even good coffee shops are often inconsistent. Well-performing professional machines are expensive and demand great skill. With most home machines, you don't stand a chance of making a decent espresso. We want to change that. 9 of these features are not available on any other espresso machine, at any price. Most of the 7 other features are seen on only a few professional machines starting at $9000. With your finger, draw the variable pressure you want over the course of making a coffee shot. Or use the included pressure profiles which imitate the best professional machines from history. Change water temperature during the course of a shot. Our research found that classic Italian professional espresso machines change temperature during a shot. You can emulate that or have a flat temperature profile. Your choice. With your finger, draw the desired water flow coming out of your coffee puck. Pressure is automatically adjusted to maintain your desired flow. Provides superior control over extraction compared to traditional pressure profiling. Enables even higher coffee extraction rates. Most espresso machines tell you the pressure at the pump, which is not helpful. Pressure at the coffee puck is what you need to know and we're one of the few machines to provide it. This information is vital to develop your puck preparation skills. Our steam heats up to 160°C (320°F), compared to traditional machines which max out at 128°C (260°F). We provide more energy per gram of water, so you can heat with less water. This means significantly less dilution of your milk and thus better flavor. Our sensors automatically detect when the coffee puck is fully saturated with water. The shot automatically starts at that point. Traditionally, this was done visually by the barista watching for the first drips. Stops the espresso shot automatically when a given amount of water has been dispensed by the espresso machine. Total water volume is displayed live during every shot. This provides easily reproducible in-glass volume without having to manually stop the machine. You can tell our espresso machine which is more important: flow or pressure. For example, if the water flow goes too fast, pressure can be automatically reduced, and vice-versa. Go way beyond the traditional 9 bar of water pressure and explore extracting with significantly finer coffee grounds. This optional technique (pioneered by Slayer®) uses a 60 second very slow pre-infusion at low pressure. Experts think this brew method brings the best out of lightly roasted beans. Instant, flexible water-temperature control. Allows precise extraction of non-coffee aromatics, such as tea, citrus zest, cocoa nibs and more. Flow, temperature, and pressure are recorded and graphically presented. You can save the performance of your best shot as a reference and graph it underneath subsequent shots. This allows you to see if the flow and pressure achieved with the current shot approximate your "God shot". Built into our machine are profiles that mimic the behavior of classic "lever machines," as well as the well known flavor characteristcs that emerge from machines by La Marzocco™, Nuova Simonelli™, Synesso® and Slayer®. Our tablet software is open source, as is our API. This allows the community to extend the capabilities of our machine. Even if you're non-technical, you'll benefit from the free software community's creations. 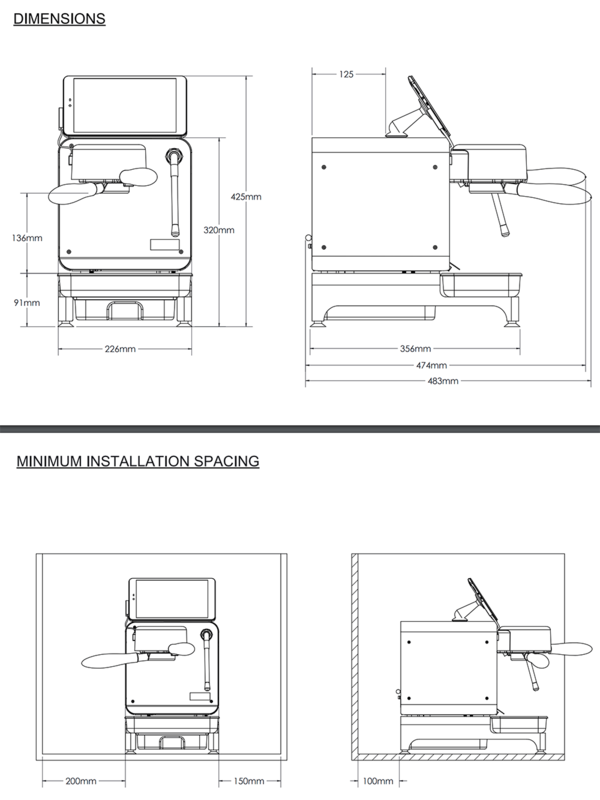 Our espresso machine weight is only 30lbs (13kg), making it much more suitable for catering jobs. A form-fitted, padded and wheeled suitcase is included. A machine that a professional barista would be pleased to have at home. Rock solid temperature, pressure profiling, and presets authored by award winning baristas to get you started. All metal chassis. Drip tray and water tank made of glazed porcelain. The holes in our portafilter basket are perfectly calibrated with a microscope. Fast warm up: always less than five minutes. Our water mixing technology guarantees accurate and instant temperature changes. Make one espresso shot after another with no pausing. Instant and endless steam immediately after your shot ends. Real-time temperature, pressure and water flow rate displayed on-screen. Espresso flows visibly from a bottomless portafilter, to help you spot problems and perfect your technique. Most home machines have a plastic water tank: ours is made of food-grade glazed porcelain. No toxic BPA water worries. No aluminum in the water path. All removable parts are dishwasher safe and made of either metal or glazed porcelain. The metal case withstands regular cleaning and (unlike plastic) isn't allergic to common cleaning products. Totally controlled from the included touch-screen tablet. It's super-easy: tap to make espresso, tap to foam milk, tap to change the brew temperature, or choose a pressure profile made for you by competition baristas. Our web site and open source tools provide an ecosystem of additional functionality, such as crowdsourced best settings for popular coffee brands, optimizing your caffeine intake, a "teaching mode" and more. The DE1+ CAD drawings are available for download. Use them to plan your dream kitchen or cafe, to accessorize your machine, or to help you in the future with repairs. Consistently accurate to +/- 1°C. Professional machines often drift by as much as 3°C and home machines are usually 10°C off. This is the most important factor in high end espresso. Easily set your espresso brew pressure between 0 and 9.5 bar. Classic espresso is around 9 bar, but recent trends favor lower pressure, such as 8.4 bar or even as low as 6 bar. Our machine is accurate to an average of 1% of your pressure goal. Choose the variable pressure you want over the course of making a coffee shot. World champion baristas have used this technology for years to win competitions, but it's never before been available in a home machine. Choose "brew recipes" that mimic the temperature and pressure characteristics of famous classic espresso machines. Imitate the flavors found in manual lever machines, La Marzocco™, and Slayer® espresso machines. An easy "tap to do this" tablet touch screen interface makes great espresso push-button simple. Over 20 tablet styles to choose from: see just the features you need. Choose the exact temperature you want the hot water to be, and how long to pour for. Have an extra hot Americano, the same way, every time. Also useful for making delicate tea. Most espresso machines tell you the pressure at the pump. Pressure at the coffee puck is actually what you need to know, and that's what our machine does. Our machine is available in two voltages, compatible with all worldwide voltages and plugs, and is certified to the UL and CE safety standards. Your espresso shot stops automatically after your set number of seconds has elapsed. HDMI output and chromecast support means you can show your clients the high technology behind their espressos as they're made. The perforated metal basket that holds your coffee grounds is a suprisingly vital component in making espresso.